The Saugus Union School District said goodbye to two long serving Governing Board members at the District’s final meeting of 2018. 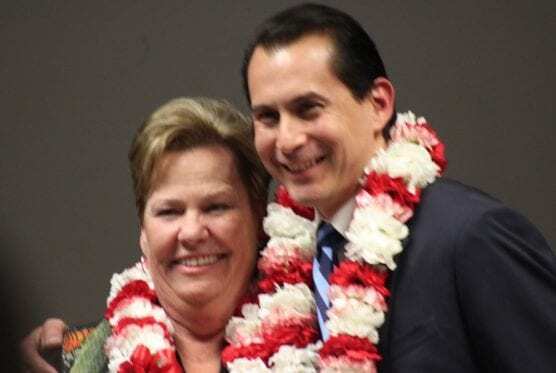 Judy Egan Umeck, who served for 22 years, and Paul De La Cerda, who served for 13 years, left the Board following ceremonies at the Dec. 11, 2018 special meeting. Umeck, who was a member of the Saugus Board since first being appointed to fill a vacancy in 1996, remains a steadfast supporter of the district’s special education and child development programs and was seen as an advocate for these programs by the entire educational community. She served the Governing Board as President and Clerk on multiple occasions and was instrumental in the openings of five schools during her tenure as well as the passage of multiple bond measures, including the most recent, Measure EE in 2014. De La Cerda, who has served since being elected in 2005, is a vocal advocate for higher education as well as a strong supporter of children’s causes, including stints on the boards of the YMCA, Children & Family Center, SCV Youth Project and Boys and Girls Club of the SCV. In addition to multiple terms as Board President and Clerk, he was instrumental in the opening of several schools and passage of several bond measures. He steps down from the Board to work towards his Ed.D. at USC. The Board resumes meetings in the new year, with the first scheduled for January 22, 2019. Check the Saugus USD website for the full 2019 schedule. The Saugus Union School District serves the Santa Clarita communities of Saugus, Valencia and Canyon Country with 15 elementary schools for 11,000 students. The District was recently awarded Gold Ribbon Awards for 14 of 15 schools with two Exemplary Arts Awards, and these awards continue a tradition of excellence for the District, which includes five National Blue Ribbon Awards, 14 California Gold Ribbon, 35 California Distinguished School Awards (for 15 schools) and six California Business for Educational Excellence Awards (one Star School and five Scholar Schools). Good bye Paul. You didn’t have enough faith to put your kids in your home school of Tesoro and had to add to the overcrowding at Westcreek. Good riddance.